Our view of the core role of a teacher is to provide engaging learning opportunities tuned to the academic, cultural and social development of each student. Introduce new ideas, manage pathways for expanding understanding, provide access to new options, leverage existing skills and introduce new ones, and measure the value of all that by looking at the quantity and quality of “flow” produced by all that cognitive activity. In other words, provide an adaptive response by creating and managing learning options well suited to the developmental needs of students. Another of the notions that figures into this effort is “modeling” – as in one of the best ways to teach just about anything is modeling how to do it. Thus Adaptive Response is embedded in everything we do – plans we write, sessions we facilitate, coaching conversations we guide. We are looking for it in the articles and research we read and share, we are talking about it with new and experienced teachers, it is a core element in our conversations with new school teams and school support organizations as we help these teams map a future they hope to build. Is it a label? Sure, though it comes, for us, from over three decades (each) working in multiple roles in education, generally finding ourselves on the leading edge (in retrospect because we never stopped to look back then) in a time when a whole lot of rethinking, experimenting and re-classification of priorities and practices in public education was going on. We see schools, old and new (practices not facilities) – some struggling, some learning to fly, some pretending to fly and some firmly in the air. We actively search for opportunities to support schools by assisting in developing plans, facilitating challenge sessions, guiding off-line conversations, providing reminders tuned to outcomes, helping analyze measures, introducing broader or narrower concepts, and supporting building the capacity to be responsive throughout the organization. Adaptive Response is a professional skill with value throughout any organization, our focus however is on educating children, all of them, by embracing their differences, building on their strengths, helping each find solutions to learning difficulties, broadening for each student her own understanding of the multiple impacts of complex factors, positively utilizing his own capacity to adapt. To teach this skill we must model it, embed it in our plans, support it in our practices and recognize it in our measures. Another view of Adaptive Response comes from deconstructing two underlying questions – “Adapting to what? – Responding how?” Without getting too deeply into a grammar lesson, adaptive response is not just about responding, but about adapting the way we respond by actively fitting the response to the learning opportunities available to the student, often meaning that our response, as teachers, must be to develop or provide access tuned to that that student and that learning opportunity. Context sensitive variables – these are the conditions or properties of things that change and or can be changed by the way we respond. 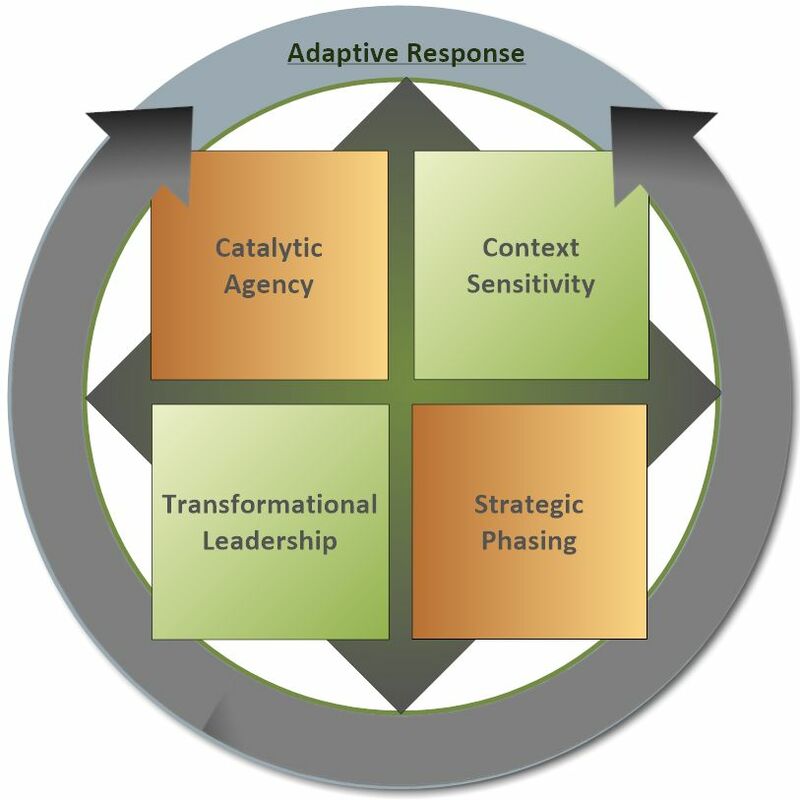 In Adaptive Response these context sensitive variables guide our response as it is through the changes to these variables that the outcome we are pursuing will occur. The name “context sensitive variable” is derived from the individual variability of our students and is closely linked to consideration of what is within our sphere of influence to change. An example might be “Can we change a student’s willingness to complete a course assignment?” If we can identify the student’s reason(s) for not completing the assignment, and they are something we can change (such as more time, or providing 1:1 tutoring, linking the student to engaging background information, offering an annotated illustration rather than a written description), then we can provide an Adaptive Response that changes the variable(s) preventing the student from completing the work. Catalytic agency – this term merges two concepts. In chemistry, a catalyst is a compound that serves to speed up a reaction without changing the product of that reaction. Catalytic convertors in car engines are the most common example where this addition to the vehicle’s exhaust system speeds up the conversion of exhaust gases to common gases, reducing harmful exhaust emissions. A catalytic agent has parallel impact in the learning environment by serving to accelerate student learning. The other concept is that of “Agency” – for this explanation we will simplify student agency to refer to what we frequently hear of as student self-efficacy – or a student’s ability to manage the variables that impact her future. Together, the concept of a Catalyst to provide acceleration and Agency to reflect a student’s ability as a self-advocate has powerful implications for the work we do on each student’s behalf – accelerated self-advocacy. Another element we believe is critical to this effort is the role of leadership. For us the concept of transformational leadership is embedded in what we mean by Adaptive Response, with the additional role of coordinating the growth of momentum in building capacity through modeling, exploring new and innovative options, supporting individual professionalism, reinforcing a positive learning culture, supporting enriched dialog, using viable and valuable processes and procedures for monitoring, measuring and adapting, and sustaining the effort. 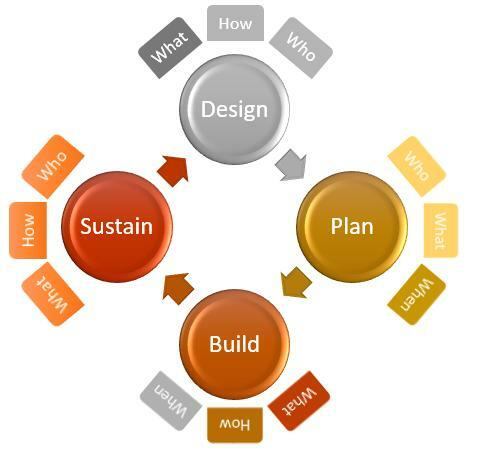 One final element – Strategic Phasing: Our history includes work across many areas, counseling, visual design and media, organizational development, instructional design, program design, collaborative team facilitation, along with teaching and school leadership. In these efforts we have facilitated the development of numerous proposals and plans and frequently come across the challenge of helping groups align their dreams and their efforts. “We know what our goal is and we are going to work our tails off to get there!” is an idea, but not a plan. Plans take time, input from stakeholders, data about conditions and possibilities, access to resources who can help, knowledge of which roads to take, which bridges you will have to cross and at least some of the barriers you may have to work around. You will also need to know how much progress you are making. (We can help with that… we even have a tool for it we call A GPS for School Development).